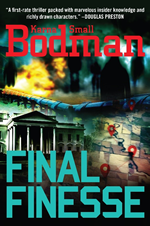 The new, revised story of Final Finesse is the third in The White House National Security series which introduces Samantha Reid, Deputy Director of the White House Office of Homeland Security. She teams up with Tripp Adams, VP of an oil and gas company to investigate the sabotage of pipelines in America’s heartland…explosions that threaten lives and cause havoc in the markets as well. When Tripp is sent overseas on a business trip, he disappears. Samantha must break all the rules to put a plan together to rescue him and also stop a team of foreign agents before they carry out their final deadly scheme.